The Yarn Harlot just wrote a post announcing that it is her 11th blogiversary, and I swear I got all choked up by it. You see - by coincidence - last night, when I could find nothing new to read, I picked up my old (autographed!) copy of Knitting Rules. 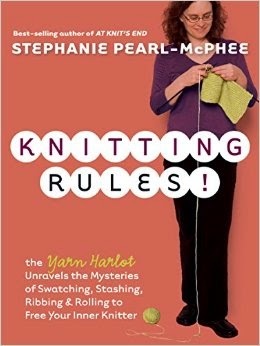 And I recognized - as I started to go through this lighthearted book about knitting and the, uh, knitting lifestyle, as Stephanie Pearl-McPhee so succinctly puts it - how that book has changed my life since I first read it a little over 7 years ago. You know, I can't think of many other books that have done that. Oh, sure, many have enhanced my life, made it better or more enjoyable. But this unassuming little book - all about yarn stashes and other knitterly foibles -has effected actual changes in how I live. A knitting book. I know. Not exactly highbrow, but still...it made me realize I could be creative even if I did leave projects unfinished or else produced knitted objects of questionable quality. It gave me the courage to knit my first pair of socks, following Stephanie's famous Sock Recipe, despite the fact that I didn’t even know what the heck DPN’s were (double-pointed needles, for you knitting ignoramuses), let alone how to use them. A little over 7 years later, here I sit, with a drawer full of homemade socks. Me! You need these to make socks. Honest. I knit all the time now, but particularly while I help my kids with their schoolwork - you see, the knitting keeps me from totally losing it while teaching Algebra for the FOURTH TIME. I learned that lesson from Knitting Rules, also: knitting isn't for patient people, knitting is for keeping impatient people from killing anyone. The original kid whose schoolwork I knitted through? He is all grown up now, Theo is, and an Army officer to boot. His sister Anna is all grown up now, too, living on her own, working and going to college. My yarn hasn't left me, though. My yarn loves me. And I still have 2 young-ish girls at home who, thanks to what I have learned from Stephanie, have grown up with permission to over-buy yarn (well, using coupons at Michaels), roll around in it if they like, and knit a multitude of projects without finishing most of them. Probably the one person who does not understand the Yarn Harlot's impact on our family is Larry, but that is only because he still hasn’t figured out that that second dresser of mine - the one I commandeered when Anna moved out - is filled with yarn, not clothes. To top it all off, when I met Stephanie in person, way back in April 2008, she said, "You're SuburbanCorrespondent? You are so funny!" No matter if she meant it or was just being kind, I lived off that compliment for a year. As most writers know, what we really want (aside from maybe being paid occasionally) is to connect. Connecting is what Stephanie has done over the past 11 years with her blog and her books, creating an awesome community of knitters (and maybe some crocheters, stranger things have happened), and many of us are the richer for it. So thank you, Stephanie, for your time and your wit and your wisdom - you've made a difference in people's lives. Really. Let's just hope Larry doesn't open that dresser, okay? Great idea! I've been wanting to learn how to knit and, Heaven knows, I need to learn to be more patient. Sounds like the perfect book! I am one of those knitting ignoramuses, so please don't include me in a book drawing, but I am surprised to learn that you haven't been knitting all of your life. You are one of the people I think of when I think of knitters. Also, if you don't tell SuperDad about the latest 2 purchases of beads (and when I say beads, I measure them in handfuls... pressed down, overflowing handfuls) I won't mention anything to Larry about that dresser full of yarn. Deal? Love reading both of your blog posts. I too have a husband with no appreciation for furniture, and who starts projects "out of nowhere" Would love the book! Count me in...now you've piqued my interest! I do knit, but haven't done so for years. I have a baby sock on needles now, convinced myself that it would be easier to learn how to turn a heal on a smaller sock. It's been on the needles for two years! I did manage to knit a Christmas stocking for my new granddaughter, but it is apparent to me that my knitting skills, such as they are, have gotten rusty. It's time to get back to it, and this book may be just what I need! Lovely post! I love the quote "...keeping impatient people from killing anyone" especially with DPNs so accessible! My mom knitted all of my dad's socks with four tiny metal DPNs and fine gauge 100% wool yarn for their entire marriage. That familiar rhythmic clicking probably is my most enduring memory of her. 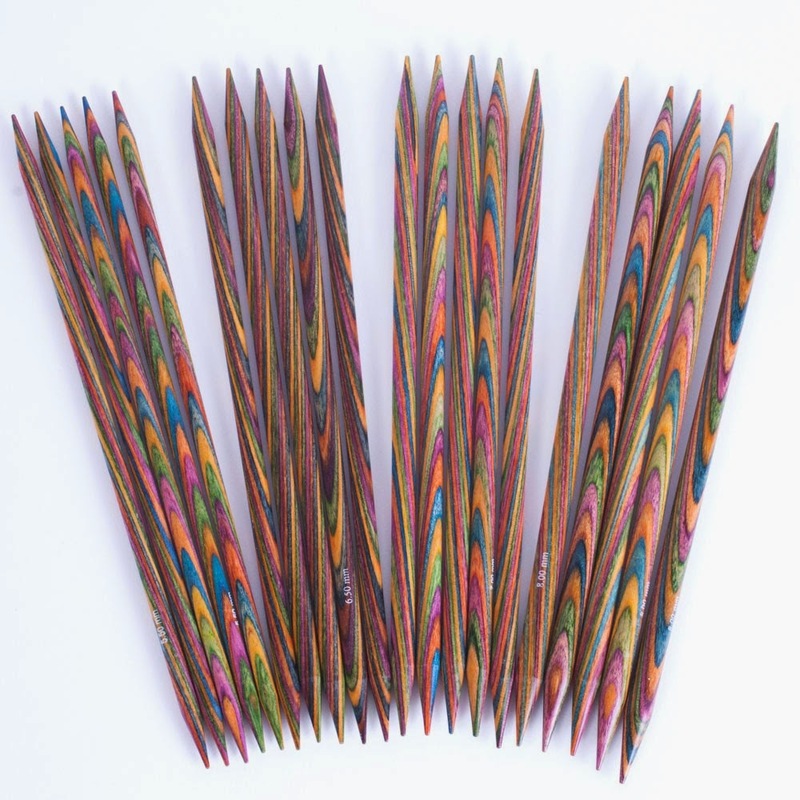 I have her needles now, but nowhere near the patience to use them. Perhaps reading this book will help me acquire that patience... count me in! That's a pretty cool retrospective of the last 8 years in yarn and child-rearing. I have shed tears over knitting, and never mastered dpns. Still hasn't stopped me from building my own hefty stash o' yarn, though! I would love, love, love to feel competent and to make beautiful things. If the book will get me there, sign me up! I already have all Stephanie's books, but I wanted to mention that if you haven't listened to the ones available on audio, I highly recommend them! I totally fit the "knitting isn't for patient people, knitting is for keeping impatient people from killing anyone" mold, too. Oh wow, I'm blown away by the claim that knitting helps impatient people from killing someone. So true! I've been knitting for almost my whole life. I was making long strands of crochet chain stitch, I think before I was even in kindergarten, and using them as pretend long hair. My first attempt at knitting was at age six, but I struggled for a long time to learn how to knit. What finally helped were some free pamphlets that my grandmother sent for from the craft columnist at our city's newspaper. I like to knit, but haven't attempted socks yet. ; Mittens, hats and scarves, an occasional sweater, but not socks. Oh goodness.....if knitting will keep me from killing people, I definitely need to start knitting furiously over the next few months! The book sounds like a fun read that might help me teach algebra in a few years!